EXECUTIVE ACCESS: WaterSound guests staying at this property have access to the WaterSound Beach Club, 4 community pools (including the 7,000 square foot zero-entry pool at the WaterSound Beach Club), 2 tennis courts located at Shark's Tooth Club and at the WaterSound Beach Club and full access to Shark's Tooth and Camp Creek Golf Courses. They also have access to the WaterSound Fitness Center and complimentary use of two kayaks or canoes for one hour per day, as well as 20% off stand-up paddle boards at the WaterColor Boathouse. DETAILS: Just steps from the beach, this gorgeous Gulf-front condo offers the perfect blend of comfort, location and style. 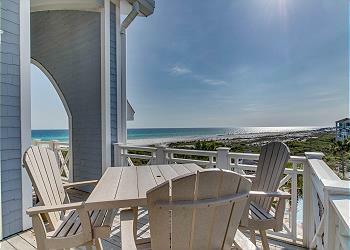 Savor your morning coffee on the balcony while taking in spectacular Gulf views. 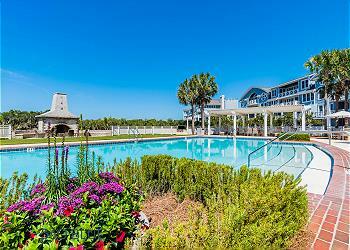 You’re just steps from the beach and all of the spectacular amenities that WaterSound has to offer. This 3-bedroom, 3-bathroom condo features a chef’s kitchen with select stainless appliances, including a gas range and wine fridge, designer cabinets and granite countertops. Adjacent and subtly tucked away is the laundry. The kitchen opens onto the dining area with table seating for 7 and candelabra-style lighting, while the counter offers seating for another 3 – and stunning Gulf views. Beautiful heart pine hardwood floors run nearly throughout, including the living room which has balcony access, Gulf views, and a vast flat-screen television – the perfect place to settle in with family and friends for a movie. The balcony has natural teak furniture, making it a great place for sundowners. Just down the hall is a guest bedroom with Gulf views, balcony access, a king bed and private bathroom with a shower and tub. Adjacent is another guest bedroom with 2 twin beds and a private bathroom with a shower/tub combo. Finally, the master bedroom features stunning Gulf views, private balcony access and an office area for those who need to get a little work down on vacation. The master also has a private bath with a double vanity, a jetted tub, walk-in shower and a walk-in closet. This home sleeps up to 6 guests. The amenities of WaterSound are a perennial favorite, especially the outdoor fireplace and the 7,000 square foot zero-entry pool at the WaterSound Beach Club. They make a great place to gather with friends and family – and to make new friends. All of the fun of 30A is waiting just beyond the gate, with Rosemary Beach, Alys Beach, Seaside and WaterColor a short drive or bike ride away. 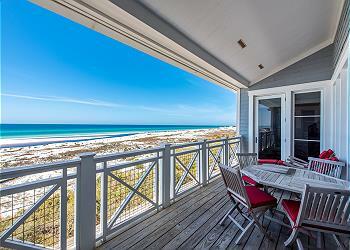 Book this Gulf-front 30A getaway at 360 Blue today. -Due to HOA rules, guests are not allowed to rent or bring their own golf carts.